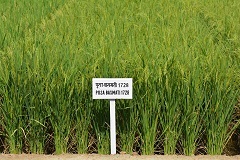 This variety is resistant to bacterial blight disease and is suitable for cultivation in Punjab, Haryana, Delhi, Uttarakhand and Western UP. 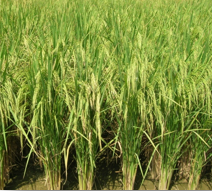 The crop is recommended for irrigated transplanted conditions and it needs water throughout the growing period. Approximate days of harvestable maturity are 140 to 145 days after sowing. 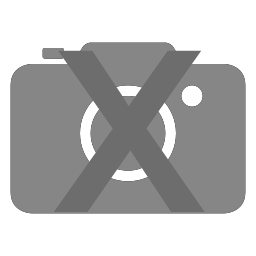 This variety is resistant to bacterial leaf blight and is suitable for cultivation in Delhi, Punjab and Haryana. Approximate days of harvestable maturity are 136-138days after sowing. 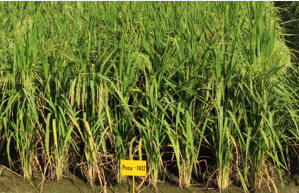 Resistant to leaf blast with an SI of 2.7 (2014) and 2.9 (2015) as compared with its Pusa Basmati 1 which is highly susceptible reaction with SI of 6.1 (2014) and 6.5 (2015). Possesses long slender grains (7.3 mm) with very occasional grain chalkiness, very good kernel length after cooking (13.8 mm) and strong aroma. 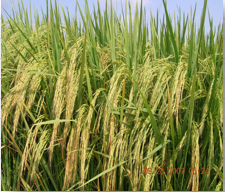 First product of molecular breeding in rice in India. 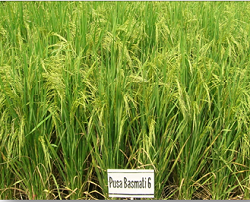 Improved Pusa Basmati 1 is an improved version of Pusa Basmati 1 with resistance to bacterial leaf blight. 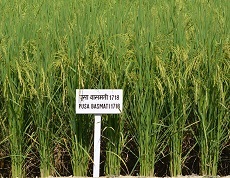 This variety possess unique Basmati quality characters namely, extra-long slender, highly aromatic grains. It has longest kernel length after cooking with an exceptionally high cooked kernel elongation ration. It has seed to seed maturity of 145 days with an average yield of 4.5 t/ha. 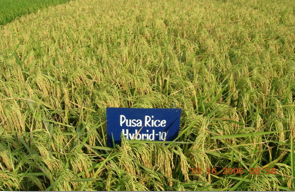 This variety overcomes all major weaknesses of Pusa Basmati 1121. It matures in 115 days with an average yield of 5 tons/ ha and possesses non-lodging and non-shattering habit. On account of being early it saves 6 irrigations. 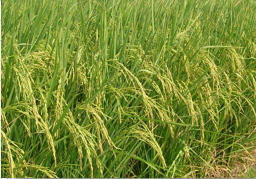 A semi-dwarf high yielding aromatic rice variety suitable for multiple cropping system in northern India. It has extra long grains and excellent cooking quality. It possesses tolerance to shattering. 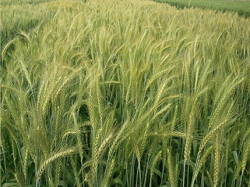 It matures in 120-125 days with an average yield of 5.5-6 tons/ ha. It has extra-long slender translucent grain. It is strongly aromatic. 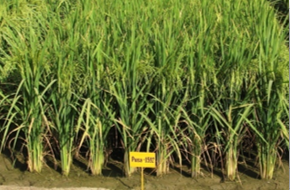 It is a MAS derived bacterial blight resistant line developed by pyramiding of bacterial blight resistance genes with yield and quality on par to the recurrent parent Pusa Sugandh 5 and also suitable for multiple cropping system in northern India. 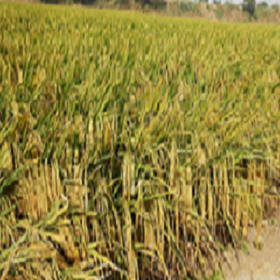 This variety is an near isogenic line (NIL) of Pusa Sugandh 5 for blast resistance. 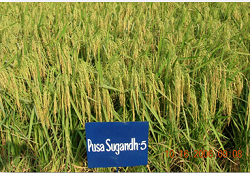 This was developed through marker assisted backcross breeding wherein genes Piz5 and Pi54 were pyramided in the background of Pusa Sugandh 5. It matures in 115-120 days with an average yield of 5.5-6 tons/ ha . 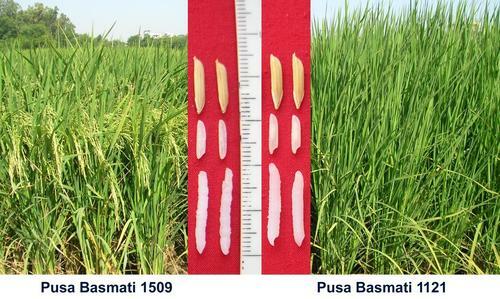 It is the first Basmati rice variety developed by pyramiding blast resistance genes showed resistance to neck blast and moderate resistance to leaf blast. Seed to seed maturity is only 120 days with an average yield of 4.6 tons/ ha. 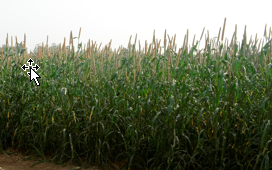 Released by CVRC in 2001 for commercial cultivation in the irrigated eco-systems of Haryana, Delhi and Uttaranchal. Released by CVRC in 1993 for commercial cultivation in Karnataka and Kerala but very popular in the state of Punjab. A non aromatic variety suitable for combine harvesting and also for rice-wheat cropping system in northern India especially in Punjab. First semi-dwarf, high yielding Basmati rice variety.It possesses excellent grain and cooking quality with soft texture and pleasant aroma.It takes 135-140 days to maturity with an Average yield of 5-5.5 t/ha.